The Waste Electrical and Electronic Equipment (WEEE) Regulations are laws that apply to electrical and electronic manufacturers. These laws are in place in order to reduce the amount of environmental waste from electronic products. You can now recycle your old electronics items with us. If you’re buying a new electronic item from us directly, we will recycle your old one for free on one for one, like for like basis. Unwanted electronic and electrical equipment is the UKs fastest growing type of waste and each year we throw away over 1.2 million tonnes of electronic waste. Many electronic and electrical items can be repaired or recycled, saving natural resources and the environment. If you do not recycle, they will end up in landfill where hazardous substances will leak out and cause soil and water contamination – harming wildlife and human health. We are pleased to offer our customers the chance to recycle their old electronic items when purchasing a new item from us. Please contact us by phone on 01920 487700 or email infouk@augustint.com for details on how to return and dispose of your WEEE item. Customers are suggested to return their small electronics items to us by post. If you prefer to have the item collected from your home, please contact us for the collection cost. 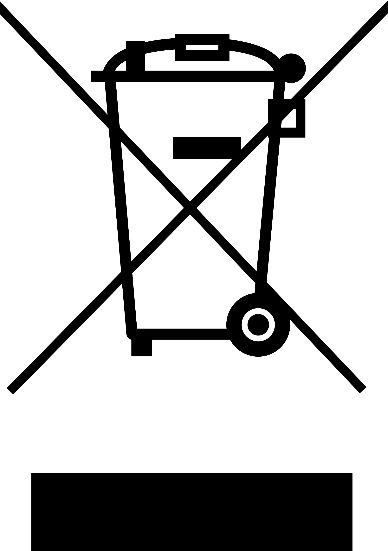 To remind you that old electronic equipment can be recycled, it is now marked with a crossed‐out wheeled bin symbol. Please do not throw any electronic equipment (including those marked with the crossed out wheeled bin symbol) in your bin.